A business phone service can give your small business a big presence without creating major expenses that negatively impact your budget. With business phone services, traveling, relocating, and running a virtual business are less of a hassle because everything will be operating from the cloud. This allows you to stay connected with your customers and business partners at all times. With a business phone service, you won’t have to worry about dropped calls or being out of range like you would with a personal phone. You also don’t have to be close to a landline or stuck in an office for important company contacts to reach you. A business phone service is a scalable solution that can adapt to the growth and changes within your company, working alongside individuals and entire teams. As your company grows and you add more staff and managers, a business phone service can accommodate them (and customers) through extensions that make company representatives more accessible. Every entrepreneur is different. Some may want to work within local markets while other business owners may want to conduct business internationally. Running a business with the help of a business phone service adds flexibility to your means of communication. Your phone number can be specific to certain cities or toll free. Most business owners appreciate the freedom that a business phone service provides. There is always somewhere to be when running a business – whether it’s a conference, commuting daily, or working in different locations for collaborative partnerships. Your business phone service will keep you from missing important calls and phone compatibility makes the process even easier. Through a business phone system, you can use the cellular phone that you already own. It doesn’t matter if your cellular device is an Android or an iPhone. Remember that toll free numbers will give your business greater global appeal. If you use a personal phone number, you risk the possibility of dropped calls, along with appearing unprofessional. Customers prefer businesses that are within their reach and have a professional support team available, if needed. This adds to the many reasons why businesses choose to have a 1 800 toll free number. Because entrepreneurs have a variety of tasks to complete each day, business phone services allow them to store and access information quickly and stay organized. Your business phone service can function as an integrative tool. Not only are customers able to call you, making outgoing calls can be done quickly from your phone, websites, or email messages. You can also use your business phone service for scheduling purposes to update and share calendars. Furthermore, a business phone is the ideal communication tool that keeps all of your employees in the know, preventing issues by promoting transparency and making current information available to everyone on the team. 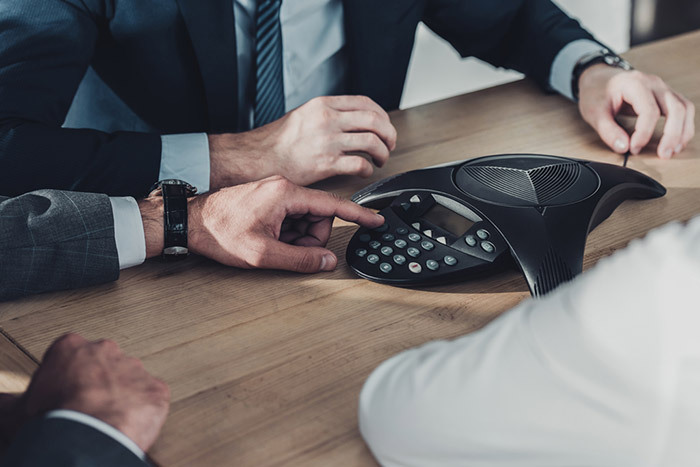 Assuming that you don’t need a business phone service is a costly mistake that often causes businesses to lose out on potential sales and miss the opportunity to build relationships with long-term customers. Professionalism should not be underestimated. When you’re starting from the ground up, a business phone service should be one of your first investments because it shows that your business is reliable and fully functional. Business phone services have a multitude of features to help grow small businesses. Therefore, it’s important to assess what features will meet your professional needs. With business phone services, all you need is a landline or cell phone, the internet, and a reliable connection. To see what works best for your customers, use your business phone service to keep up with important metrics and responses. How long were customers on the line with a representative? How long were callers waiting on hold? Keeping up with this information will provide further insight regarding the changes that will need to be made to grow the business going forward. Customers often look to business owners for reassurance and want customer service representatives to be available to them when needed. Appeal to your target market by sharing a business phone number with your team so that someone is always available to answer questions and offer assistance to callers. You should also consider the importance of a business phone service when you are advertising locally and using online campaigns.